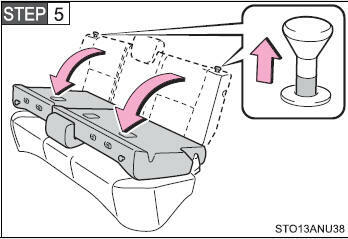 Stow the rear seat belt buckles as shown. Use the seat belt hangers to prevent the belts from being tangled. 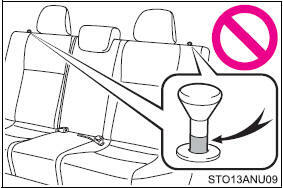 Lower the center head restraint to the lowest position. Pull the seatback lock release knob and fold the seatback down. Each seatback may be folded separately. 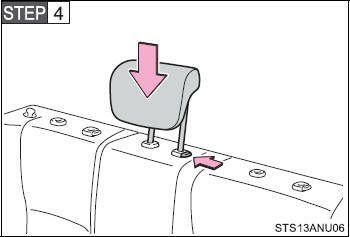 Pull both seatback lock release knobs at the same time and fold the seatback down. ●Stop the vehicle on level ground, set the parking brake and shift the shift lever to P (vehicles with an automatic transmission) or N (vehicles with a manual transmission). ●Do not allow anyone to sit on a folded seatback or in the luggage compartment while driving. ●Do not allow children to enter the luggage compartment. 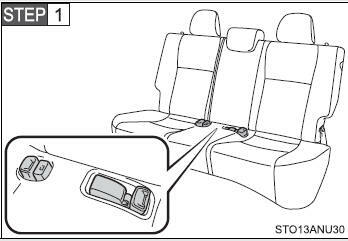 ●For vehicles with a split rear seats, do not allow anyone sit on the rear center seat if the rear right seat is folded down, as the seat belt buckle for the rear center seat belt is then concealed under the folded seat and cannot be used. 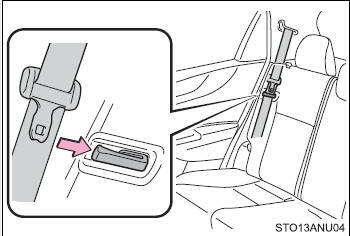 ●If it is necessary to detach the head restraints, remove it from the vehicle or store it securely in the luggage compartment. This will prevent it from injuring passengers in the event of sudden braking, sudden swerving or an accident. ●Depending on the position of the front seat, it may interfere when trying to fold down the rear seatbacks. If this happens, adjust the position of the front seat. 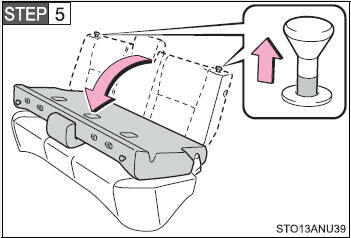 ●Make sure that the seatback is securely locked in position by lightly pushing it back and forth. The seat belts and the buckles must be stowed before you fold down the rear seatbacks.